A lot of project managers would relate to the comment that it seems like the project manager does a lot of administrative work. However, to be honest, administrative work is also in the eye of the beholder. What one person sees as administrative work might be a fundamental aspect of project management to another person. The project manager leads the team through a definition and planning phase, and then monitors and controls the project until it successfully (you hope) concludes. This would include managing scope, issues, staff, quality, etc. Notice that performing administrative work is not a part of that simple definition. The first question to ask yourself is exactly what is administrative work for a project manager? Part of the answer has to do with how you feel about the various responsibilities that a project manager has. Let’s look at a few and see what you think. You can tell a lot about the mindset of a project manager based on how they look at status reporting. Many project managers think that status reporting falls under administrative work. However, our view is that managing expectations through status reporting and status meetings is a fundamental role of a project manager. Sorry – it is not administrative work. We think reporting status is the minimum communication expectation of a project manager. If you think it is overhead then you may not understand the vital responsibility of communicating proactively on your project. Some project managers hate to update a schedule, and think that this is an administrative burden. What do you think? Sorry – understanding where you are at on your schedule is a fundamental project management process – not administration. Again, many project managers just want to get going and start the work. To them, planning is an afterthought, not something that should hold up a project. Do you need to Charter your project? Sorry, the answer is yes. Creating a Charter is not administrative work. There is always a legitimate question as to how long the Charter needs to be, but there never should be a question about doing it or not doing it. Many projects have forms that they use to request scope changes, track scope changes, track issues, etc. Are these administrative tasks, or are they the valuable tools of a project manager? Scope changes, risks, issues, etc. need to be documented. It is not overhead. It is fundamental to your success. It is always legitimate to push back on the length of forms, the amount of information required and the number of steps in a process. For instance, if you have to complete a ten-page charter for a 30 day project, I would agree that there is some non-value added work involved. However, some project managers think that anything that requires writing (or typing) is administrative. But is that really the case? 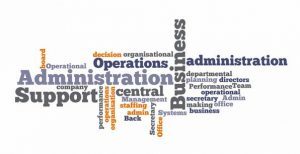 Much of what might appear to be administrative work is really the direct input or output related to project management. Project managers can master this aspect of their job and relegate it to a smaller percentage of their time. However, if you have an aversion to documenting things, project management may not be right for you.